Hands down best feature this year to date, Data Table Filtering! In the June 2018 Power BI Desktop Microsoft released the ability for you to navigate to the Data Table view. While on this view drop down icons now appear which enable filtering of the Data Table. This is super helpful when looking at the raw data that has been loaded into your data model. Check out the video below to see how the feature works. For those of you who like Excel, and data tables in Excel, this feature will make you feel right at home within a pivot table type feel. I hope you enjoy this month’s update as much as I did. Thanks for stopping by. For the official documentation from Microsoft follow this link to the blog announcement. 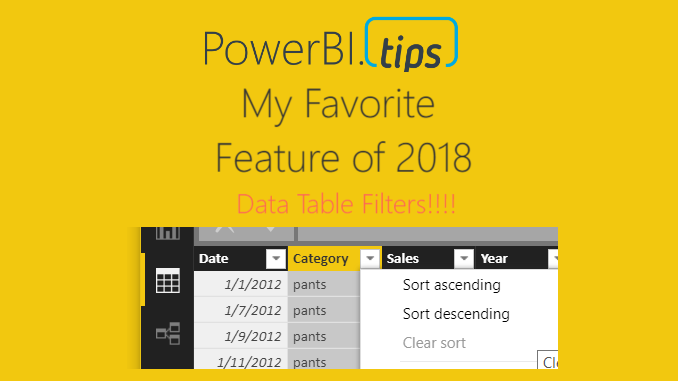 If you like the content generated from PowerBI.Tips please follow me on all the social outlets to stay up to date on all the latest features and free tutorials. I want to filter the data before it is loading into Power BI Data Model. For example I have Data in Table from Jan-2001 till date(02-Jan-2019). But I want my data from Jan-2017. The Key column is TransactionDate in SQL Server table. I tried the option Parametrized Query, it is not working properly. What I observed is that its taken long time before loading because what I guess is that Power BI is loading all the data first in memory, then it is applying the parameterized query. I would suggest writing an SQL query that pre-filters the data before you begin shaping it in the Power Query editor. This will only pull the data for the selected date ranges.